Those who travel to the Republic of Guinea will find this beautiful and intriguing west African country to be an incredibly worthwhile destination. Surrounded by Guinea-Bissau, Senegal, Mali, Côte d'Ivoire, Liberia and Sierra Leone, the country has somewhat illogical borders that are a relic of the colonial era when the region was shared out between European powers. Today these borders enclose a very diverse population of ethnic and linguistic groups, and a varied terrain that ranges from expansive savannah in the south to mountainous, heavily forested highlands in the northwest. 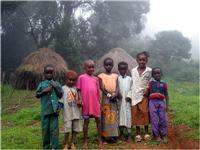 Indeed Guinea's chief attraction is its spectacular and mostly unspoiled natural scenery. West Africa's three great rivers - the Gambia, the Senegal and the Niger - all originate here. The splendid Guinea Highlands are centered on Mount Nimba, the highest point in the country, while the Fouta Djalon highlands are renowned for incredible views and superb hiking. Other places of interest in Guinea include the spiritual centre of Kankan, the high altitude town of Dalaba, party-mad Faranah, and the incredible beaches of Cape Verga. The population is mostly Muslim, French speaking, and rural, with the exception of the pleasant and relatively cosmopolitan capital city, Conakry, located on the island of Tombo. The city is renowned for its lively music scene and attractive layout. Despite its rewarding and striking attractions Guinea remains one of the least visited countries in Africa. Visas can be hard to get, which may deter those travellers planning a trip here. The government, despite some concessions in recent years, remains a de facto dictatorship which means few freedoms for the people but generally safe conditions for visitors. We are looking for contributors for our Guinea travel guide. If you are a local, a regular traveller to Guinea or a travel professional with time to contribute and answer occasional forum questions, please contact us.